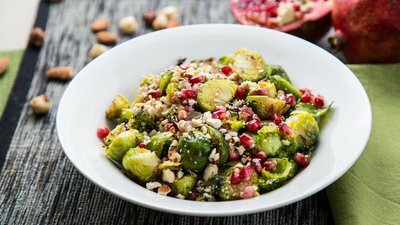 Brussels sprouts are not only delicious, they're also an incredibly healthy food. They support healthy cholesterol and blood-glucose levels. They're also loaded with vitamin K, vitamin C, folate, manganese, B vitamins, choline, copper, potassium, phosphorus, iron, and magnesium, as well as calcium and zinc. And a one cup serving only amounts to a stingy 56 calories. This noble vegetable has been delighting palettes since ancient Rome. Make any one of the following recipes and start looking forward to your next serving of this crowned prince of vegetables. This fantastic side dish is quick and easy to prepare. Mushrooms are surprisingly high in overall dietary protein, with more than 7 grams of protein per dozen, making this is a good option for those who struggle to get enough dietary protein. Who knew you could make soup from Brussels sprouts? This tomato-based recipe is tasty—and keeps in the fridge. Make a big batch and serve it whenever hunger strikes. If you have a sweet tooth, you're sure to love this recipe. It has fiber from the Brussels sprouts, healthy fats from pecans, and a hint of sweetness from the cranberries. This is the perfect way to get your vegetables, increase your calorie intake, and give your body what it needs to build muscle. This cheesy dish is a real crowd pleaser—and one of the easiest ways to serve Brussels sprouts. Because it calls for both butter and cheese, it's the perfect dish to accompany a protein source when you're following a low-carb, high-fat diet plan. If you aren't looking to add as much fat to your menu, simply cut the butter in half or cut it altogether and substitute with a light butter spread or powdered butter sprinkles for taste. If you totally omit the butter, use a little olive or coconut oil to cook the sprouts. Pomegranates contain a very high dose of antioxidants, which combat free radical damage and oxidation. It's also rich in dietary fiber as well as vitamin C. The nuts deliver healthy fat and even more fiber, while giving the recipe a delicious crunchy texture. Protein, fats, and fiber make for a super-simple super dish.